While Louisville welcomed Old Forester Distillery back to its original location this week, new whiskies from Kentucky, Scotland, and beyond are rolling out to store shelves. Macallan just can’t stay still. After opening its stunning new distillery, unveiling a packaging revamp, and announcing its oldest-ever single malt, the company is releasing two new limited-edition whiskies: Macallan M Black follows up in the M series, making a dramatic entrance in a black crystal Lalique decanter and with a price—$6,995—to match. Meanwhile, Macallan Edition No. 4 will hit shelves next month at $100 a bottle, showcasing the concept of structure in whisky. Revival is the name of the game for three Kentucky straight bourbons this week—literally so, in the case of Wild Turkey Master’s Keep Revival. 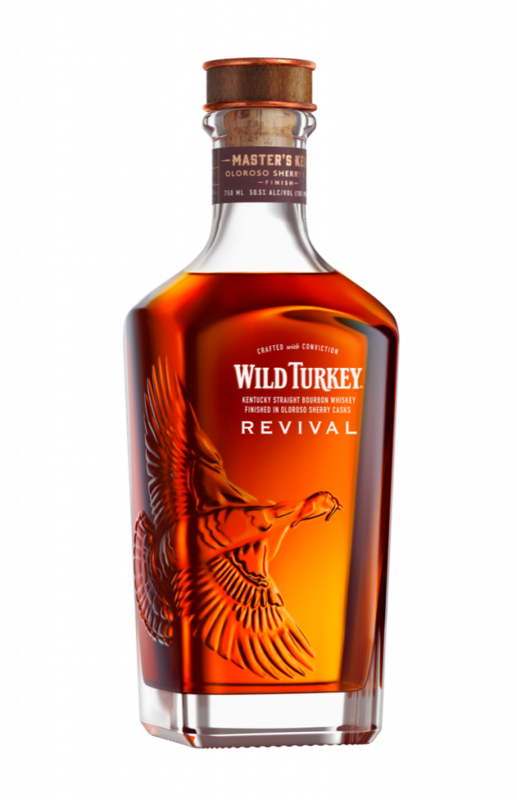 The newest iteration of master distiller Eddie Russell’s blending genius, Revival was inspired by Wild Turkey Sherry Signature, a sherry-finished bourbon created by Eddie’s father, master distiller Jimmy Russell, in the early 2000s. This new Master’s Keep includes 12-15 year old bourbons finished in 20 year old oloroso sherry casks. 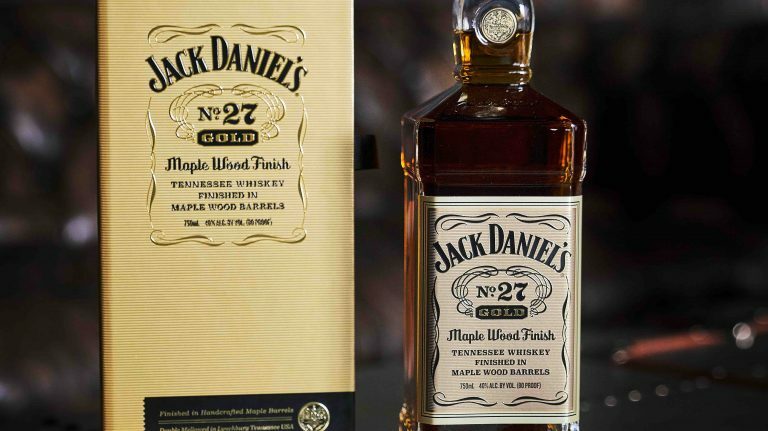 If this whiskey is anything like its predecessor, Master’s Keep Decades—which ranked number three in the Whisky Advocate Top 20 last year—we’re in for a real treat, even at the price of $150 a bottle. Meanwhile, Brown-Forman is bringing back two old bourbon brands: King of Kentucky and Old Forester The President’s Choice. Both whiskeys are available in limited amounts in Kentucky only. 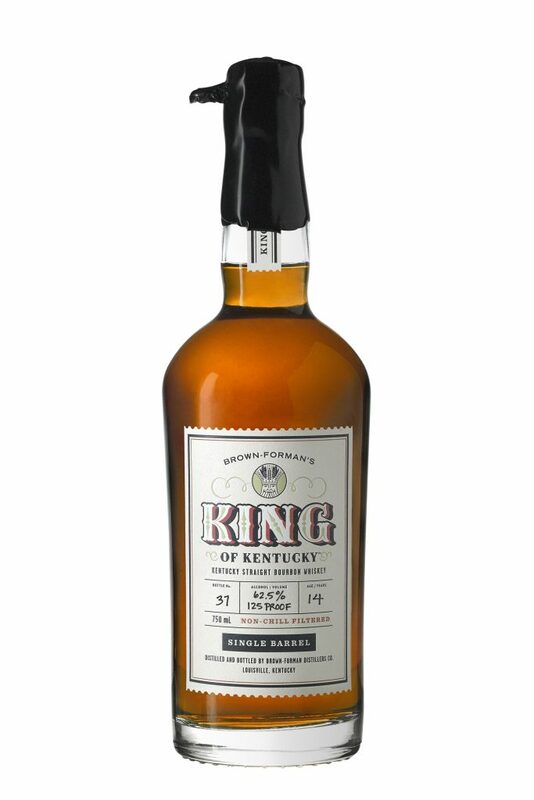 King of Kentucky is a 14 year old, barrel-proof straight bourbon that costs $200. A new batch will be released regularly, though each one will vary in age and proof. Old Forester The President’s Choice, meanwhile, is a single-barrel bourbon aged for about eight years and selected by—you guessed it—Brown-Forman’s president, Campbell Brown. It costs $90 and will be available on a regular basis, mainly at Old Forester’s new distillery. From Scottish independent bottler Blackadder comes a cask-strength, sherry-heavy Highlands single malt. 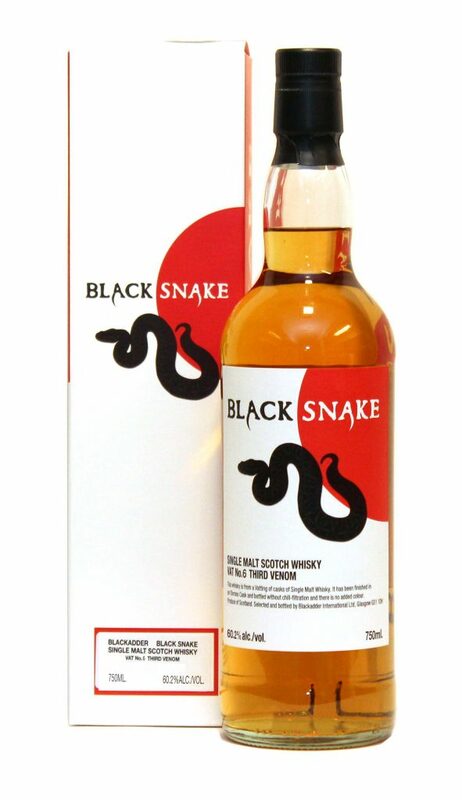 Made at an undisclosed distillery, Black Snake is the result of a unique modified solera system. The whisky is released periodically as a single cask; the current iteration in the U.S. clocks in at 60.2% ABV, with a price of $100. 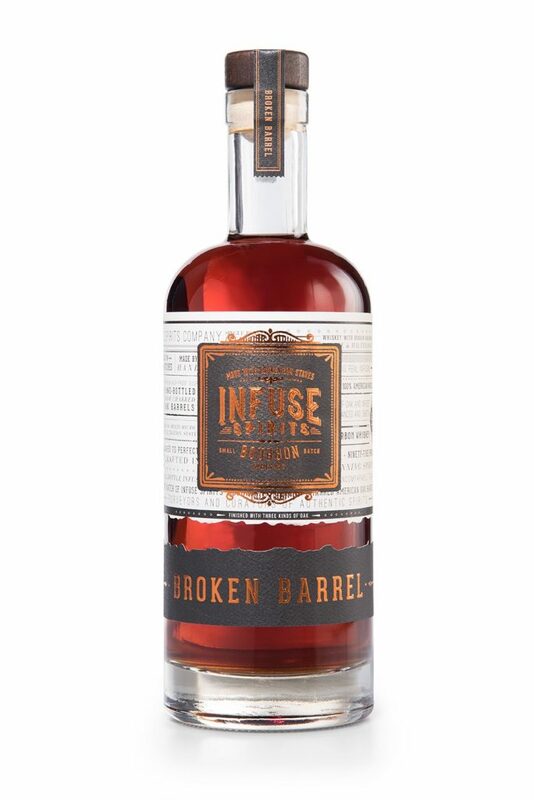 California-based Infuse Spirits recently released its third batch of Broken Barrel bourbon. 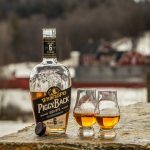 The whiskey is sourced from Kentucky and aged for six months before being infused with a variety of oak staves to impart additional flavors. Available in limited amounts for $30, Batch 004 will be out soon. 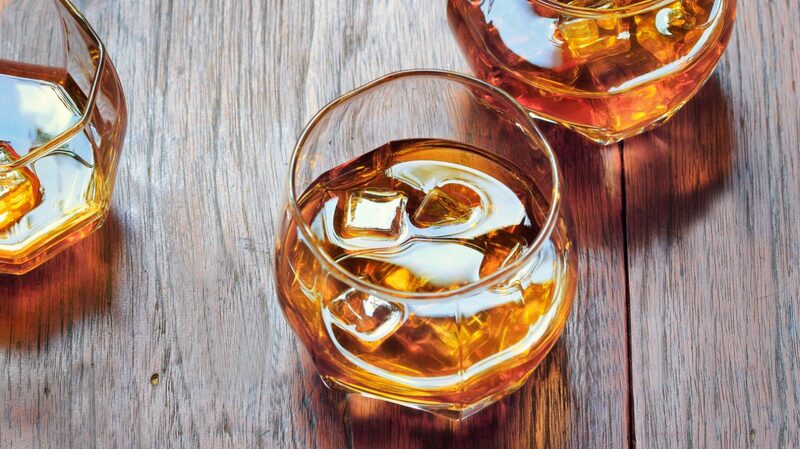 Finally, don’t miss the weirdest flavored whiskey we’ve ever heard of. 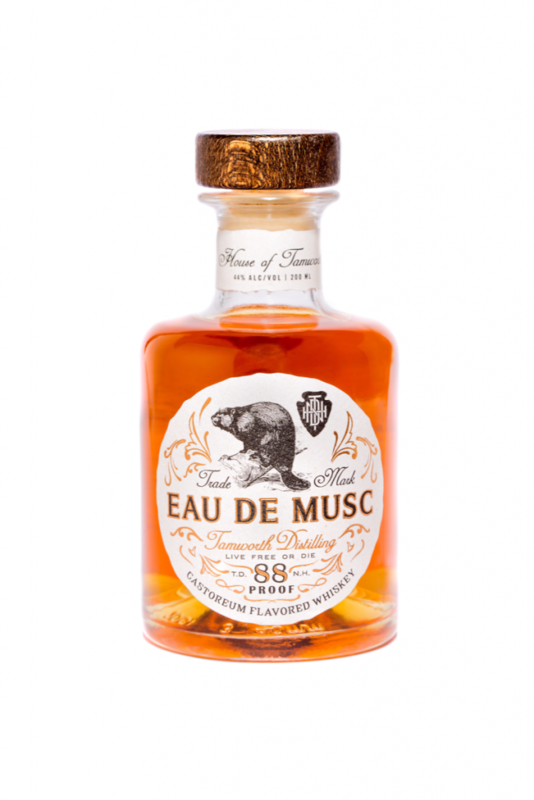 Made at New Hampshire’s Tamworth Distilling, Eau de Musc infuses 2 year old straight bourbon with castoreum, a substance that comes from beavers’ behinds. If you’re curious to try it, it’s available for purchase online at Warehouse Wines & Spirits, costing $65 for a 200-ml. bottle. Read on for full details. 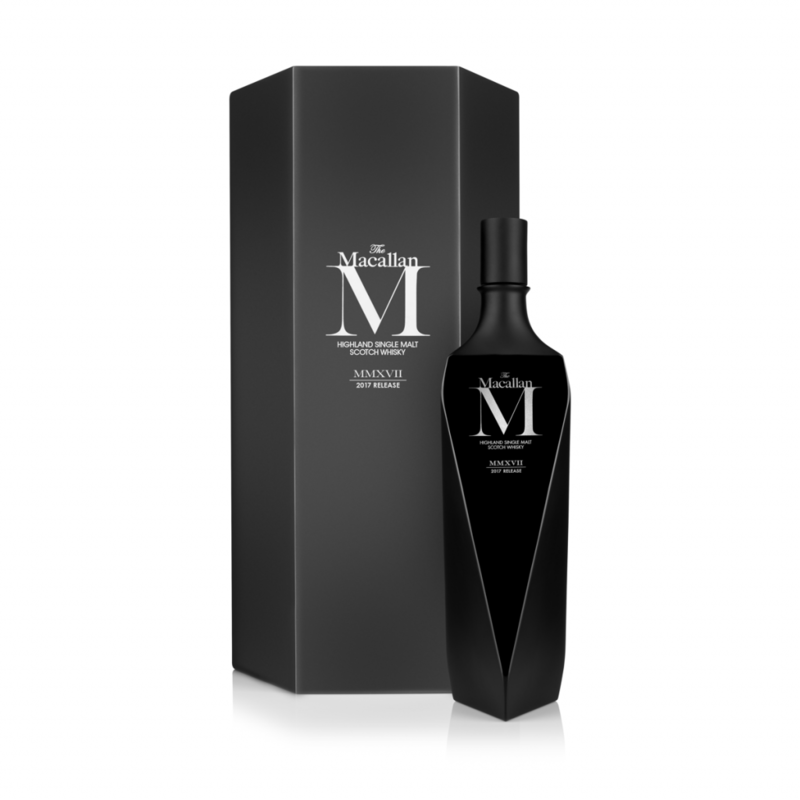 A new release in the Macallan M series, Macallan M Black is packaged in a first-of-its-kind black crystal decanter. 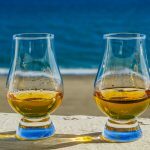 There is limited information available about the whisky itself, other than it comes from a “very limited number” of sherry-seasoned oak casks. The brand’s tasting notes describe it as having aromas and flavors of chocolate, espresso, fruit, and a hint of peat. If that 72 year old Macallan that costs $65,000 is out of your price range—but $7,000 is not—Macallan M may be the whisky for you. The focus here is clearly on the packaging: the six-sided bottle represents Macallan’s “Six Pillars” (Spiritual Home, Curiously Small Stills, Finest Cut, Exceptional Oak Casks, Natural Color, and Peerless Spirit). But, knowing Macallan, the whisky inside will be no slouch either. Time for round 4 in Macallan’s Edition series, which highlights the use of wood in creating whisky’s flavor. This single malt whisky was aged in both European and American oak sherry casks (500-liter butts and puncheons and 250-liter hogsheads) sourced from four cooperages in Jerez: Tevasa, José y Miguel Martin, Diego Martin Rosado, and Vasyma. The whisky was developed by master distiller Nick Savage, and is meant to showcase structure—an homage to the unique structure of Macallan’s new distillery, which recently opened. Many Macallan limited releases are highly sought-after, so expect Edition No. 4 to be one of them. Unlike very expensive bottles, however—like the Macallan M Black above—Edition No. 4 is actually priced for drinking, and savvy collectors may buy a bottle to save and a bottle to enjoy now. 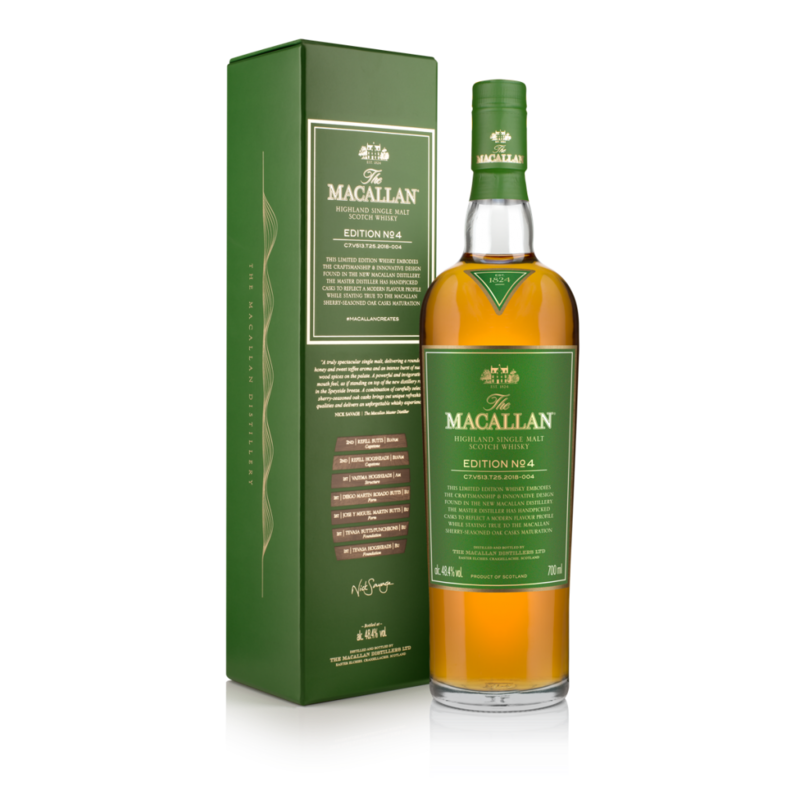 Past releases in this series have scored well: Macallan Edition No. 1 garnered 87 points, while Editions No. 2 and No. 3 each got 90 points. The newest release of Wild Turkey Master’s Keep was inspired by an old Wild Turkey product called Sherry Signature, a 10 year old, oloroso sherry cask-finished bourbon released in the early 2000s by master distiller Jimmy Russell. His son, co-master distiller Eddie Russell, created this edition of Master’s Keep in homage to that whiskey, finishing 12-15 year old bourbons in oloroso sherry casks that were at least 20 years old. The Master’s Keep series has proven its excellence: the first release scored 91 points, while Master’s Keep Decades was rated 94 points and number three in the Whisky Advocate Top 20 Whiskies of 2017. Master distiller Eddie Russell (who sat down to talk on camera about distilling with his father, Jimmy, and now his son, Bruce) knows exactly what he’s doing here, and we can’t wait to try this new release. This new whiskey revives a very old brand, first created in 1881 as a straight bourbon and later turned into a blended whiskey. It was discontinued in 1968. 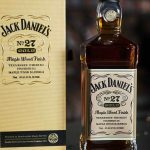 Brown-Forman, which owns Jack Daniel’s and Woodford Reserve, among other whiskeys, will release a new batch of King of Kentucky every year or so. The whiskey’s age and other details will vary, but it will always be a barrel-proof, minimally filtered straight bourbon. Rated 94 points in the latest Whisky Advocate Buying Guide, King of Kentucky is definitely a bourbon worth checking out—if you can get your hands on a bottle. You’ll have to get to Kentucky to find one, and with only 1,000 bottles for sale, it’s likely to sell out quickly. Good luck. In honor of the opening of its downtown Louisville distillery, Old Forester is reintroducing a historic brand, last available in 1972. 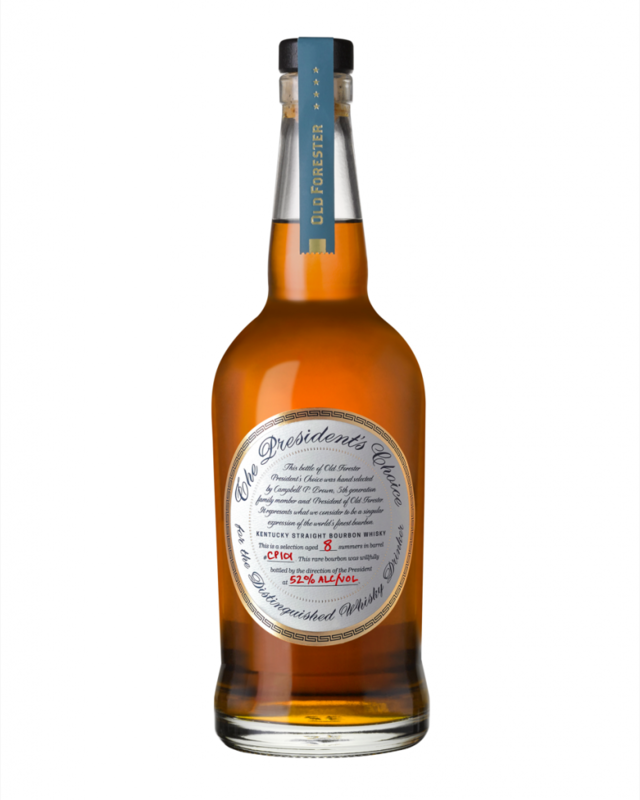 The President’s Choice is a single barrel bourbon that will typically be 8 years old and bottled at 110 to 120 proof. 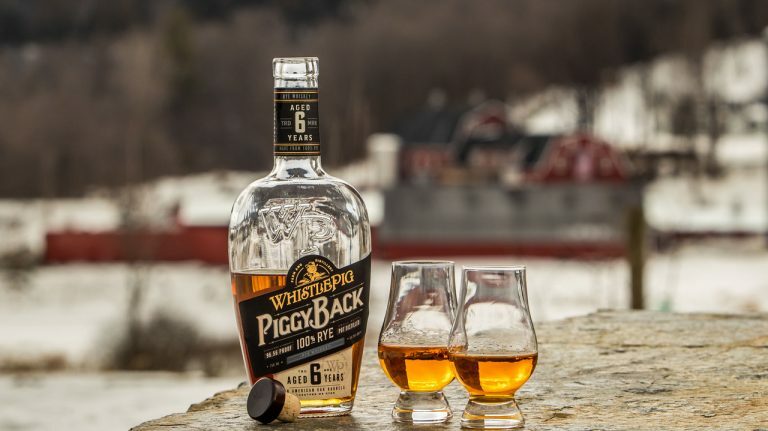 As the name suggests, Brown-Forman president Campbell Brown will select each of the single barrels for the brand, which will be for sale in limited quantities at the distillery and a few Kentucky retail stores. Much like remaking classic movies, bringing back old whiskey brands can be a fruitful endeavor for both distillers and drinkers. The distiller gets to celebrate a storied legacy while the whiskey lover has a chance to re-experience an old favorite—or get to know it for the first time. Sometimes the whiskey in question bears little to no resemblance to its forebear; in this case, since Old Forester has been continuously distilled for almost 150 years, The President’s Choice is likely to share some similarities with previous iterations, though of course it varies based on each president’s individual palate. Availability: 464 750-ml. bottles and 90 200-ml. bottles in CA, CO, DE, FL, GA, IL, MA, MD, MN, NY, TX, TN, and Washington, D.C. If you love high-strength sherry bombs, this is the scotch for you. With such a unique maturation process and high proof, it would be difficult to find more complexity and value at the price. 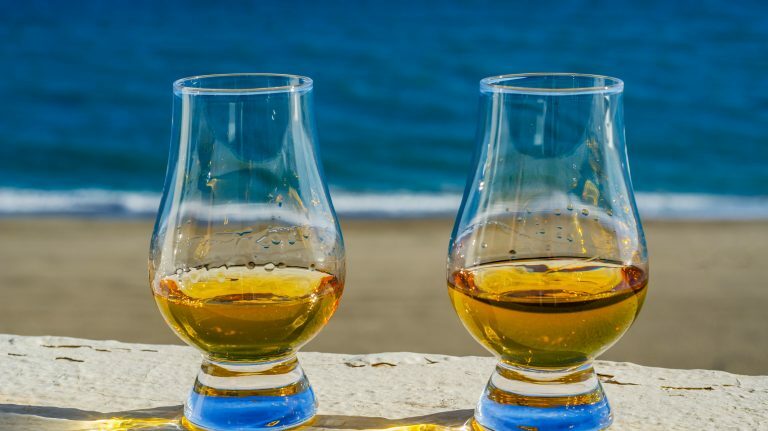 Sure, you may not know which distillery made the single malt, but that’s normal for independent bottlers—and it shouldn’t be a reason to stay away from them. Infuse Spirits, based in Santa Monica, California, creates this whiskey using bourbon distilled in Kentucky and aged for 6 months. The bourbon is then transferred to steel tanks that contain staves made of different types of oak, where it spends anywhere from 5 to 21 days taking on additional flavors. Infuse recently released Batch 003, which used French and American oak staves, as well as staves from oloroso sherry casks. Broken Barrel bourbon debuted in August 2017, and Batch 003 recently came out. Batch 004 will be ready soon, Infuse Spirits is planning two or three more batches for 2018. Each batch will have a different flavor profile depending on the types of oak staves used in the infusion process. Call this the most unique flavored whiskey ever made: Tamworth Distillery infuses its 2 year old Chocorua bourbon with castoreum, an oil found in sacs located beneath beavers’ tails. You read that correctly. In addition to castoreum, the bourbon is also infused with birch oil, raspberry, and a spice called Canadian snakeroot. Apparently, rural communities in New Hampshire, where Tamworth is located, have to routinely cull the beaver population in order to maintain a healthy ecosystem. The distillery gets the castoreum from a trapper, and the rest of the beaver—fur and meat—is sold or consumed. Needless to say, this flavored whiskey will not be to everyone’s taste—and it’s certainly not vegan-friendly. Castoreum may sound like a bizarre ingredient to use for flavoring, but the truth is that it is a legal food additive that is occasionally used when creating vanilla, raspberry, or strawberry flavorings. Have you tasted Eau de Musc? Let us know what you thought.